The Hammer and I were in Southern Utah last weekend. And in general just having a great time. 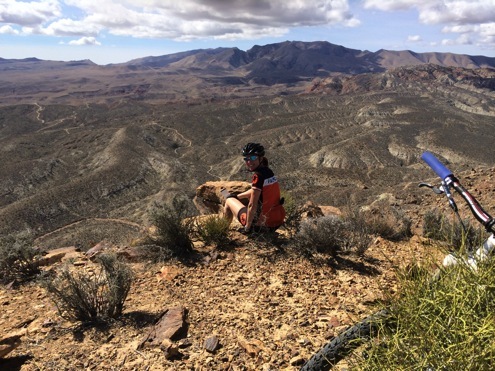 As we rode and hiked, however, I constantly noticed something: my gut. I’ve managed to put back on a bunch of the weight I dropped last year (which is why all the pictures I’m showing above are of The Hammer, not of me). And it seems that, in the absence of an imminent race or a reason to keep my feet to the fire, I haven’t dropped much of it at all since the beginning of the year. (And what little I had dropped, I’ve put back on during our anniversary trip). I’ve got a sneaking suspicion I’m not the only one who’s put on a few pounds during the winter months. And I suspect I’m not the only one who hasn’t done that fantastic of a job with keeping the weight off, and who would like to lighten up before summer gets into full swing. So: time for a weight loss contest. Fair warning, though: this is not something you will want to join unless you are committed now, and plan to stay committed for the next few months (at least). Because this is a contest with some teeth. I’ve partnered up with my friends at Beeminder to create a weight-loss contest. It’s not about how much you lose, and it’s not about how fast you lose it. It’s about setting a goal, then staying committed to the goal and being accountable when you slip up. Between now and Summer Solstice (June 21), you’re going to need to weigh and report in every day. As long as you stay on track (or better than on track), you earn points that will keep you up on the leaderboard. At the end of which, either the outright winner or a person randomly drawn from all the tied winners (because that’s possible and even likely) will win a pair of Rapha bibshorts (worth $235), which I am going to pay for myself. So, that’s the carrot. But there’s also a stick. Every time you go off-track, it will — very literally — cost you. And the more times you go off track, the more it’s going to cost. It’s a tough program. And if you’re serious about losing some weight, maybe a program tough enough to hurt when you cheat might be what you need, too. And I’m stoked to get started. First, you go to the sign-up page at beeminder.com/fatcyclist. 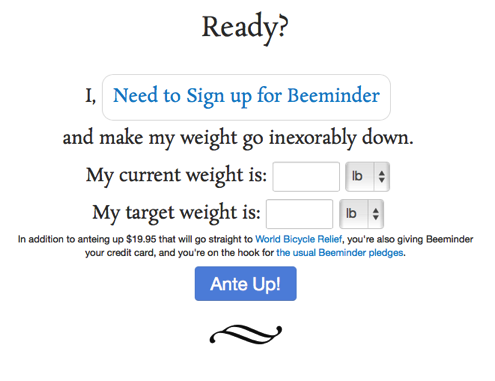 Toward the bottom of the page, you’ll have the options to sign up for Beeminder and set your current and target weight (i.e., the weight you want to be at on June 21). 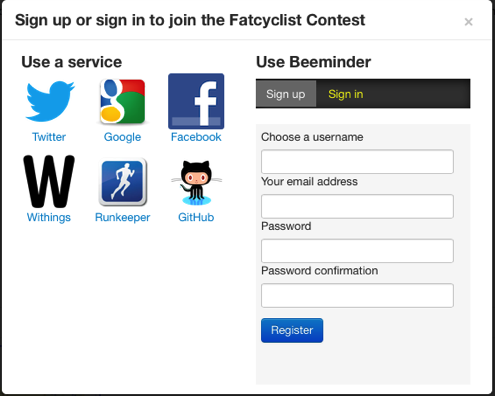 The first thing you need to do is click the “Need to Sign up for Beeminder” link, which will let you sign in using your Twitter or FB account, or just signing up with Beeminder itself. I don’t want people signing up who don’t intend to play for reals. Consider this $19.95 an “are you serious” test. To raise money for a good cause. Your $19.95 is completely in support of The Hammer’s fundraising efforts as a new ambassador for World Bicycle Relief. As in, all of your ante goes to WBR. Once you’ve paid your $19.95 (via credit card), you’re all set to go and are taken to your own personal page. 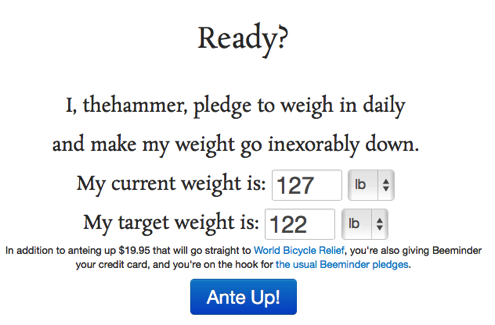 You should bookmark this page and come back every day to report your weight (Beeminder also has options where you can text and email your weight in, keeping it all pretty darned convenient). The Yellow Band: The yellow band going down the chart is called “the yellow brick road” and is the range of weight you want to be at to hit your goal. If you can keep your weight somewhere on the road, you’re doing OK. 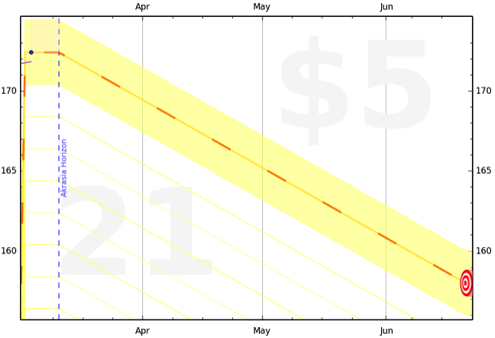 The Dotted Orange Center Line: If you can keep your weight below the dotted orange center line, you’re doing awesome. The Dot Colors: Each dot is a weigh-in data point. A green dot means you’re actually below the good side of the road. A blue dot means you’re on the “good” side of the road, below the dotted center line. An orange dot means you’re in danger: you’re still on the road, but in danger of moving off it. And a red dot means you’ve moved off the wrong side of the road — you’ve derailed — and you’re going to have to pay up. From here, I can see my yellow brick road for getting from where I am now (172.4) to 158, by June 21. And I’m determined to stay on (or really really close to) the “good side” of that yellow brick road for the duration of the contest. Watch me fill this graph up with data as time progresses. Darn it, there’s gonna be lots and lots of blue dots. 3 points: Every day you’re on the right side of the yellow brick road (a blue dot), you get three points. 2 points: You get 2 points every day you outperform the yellow brick road (a green dot). Yes, you get fewer points for losing weight too fast. This isn’t a contest about crash dieting; it’s a contest about being slow and steady. 1 point: Every day you’re on the wrong side of the yellow brick road (orange dot), you get one point. 0 points: If you go off the yellow brick road or don’t report your weight for the day, you get 0 points. During the registration period (now until midnight, March 11), points are for practice. On March 12, everyone’s points reset to 0 and the contest begins in earnest. Whoever has the most points on June 21 wins a pair of what have become my favorite cycling luxury item — Rapha Classic Bib Shorts (or the women’s equivalent thereof). If there’s a tie for first place, I’ll draw from the winners randomly. If I win, I’ll buy the shorts for myself. Why an expensive pair of bib shorts? Because these are really good shorts. I love mine. I have two pair (one that Rapha comped me, and one that I told The Hammer I wanted for Christmas because then I can pretty much wear them for every ride). So, what happens when you derail and go off the bad side of the yellow brick road? Well, the first time, you get a warning. It doesn’t cost you anything. The second time, it costs you $5, which is charged to the credit card you give when you start this contest. The next time, it costs $10. Then $30. Then $90. Then $270. And so forth. So yeah. You don’t want to derail more than three times. Or four at the most. Because that’s going to hurt. So, once again: you shouldn’t sign up unless you’re really, truly committed to making a change and sticking to your program ’til at least June 21. By the way, half of your “derail” money goes to WBR, and the other half goes to the folks at Beeminder, who deserve to make at least a little money off this project. But What If You’re Freaked Out by the Derailment Escalation? Be sure to save your changes (the site will warn you if you try to leave without saving, by the way). Okay, enough jibber-jabber. It’s time to sign up. Weigh in and get out your credit card. And then start posting your weigh-in info every day — and watch to see how others are doing over at the leaderboard. You stand to win a pair of very nice shorts, and you stand to lose whatever weight you’ve been wanting to get rid of forever, but haven’t been quite motivated enough to really step up your game. Sign up now. And I’ll see you on the leaderboard. PS: The Beeminder folks have promised to watch this site and answer your questions as you sign up and configure your goals. What if I’m in a recently-started beeminder already? Should I start a new one? Hey Berry! Go to beeminder.com/fatcyclist and it should prompt you to add your existing weight loss goal. Also: Hey everyone! So excited about this contest! Thanks so much, Fatty! Good idea for a contest! Good luck, everyone! What if I miss a day of check in because I am on the road and don’t have access to a scale? Is it just I have to have enough buffer to sustain the upward trend of my weight or does it blast me with a fine simply because I didn’t weigh in? @Liz: No, no facebook posting. We should totally add that, but if we do we’ll have it be totally opt-in. I think it’s the slimiest thing ever when apps do that without getting very explicit permission. @David: if you skip weighing for a day we assume you stayed the same weight, so as long as you are far enough below the top edge of the road, there’s no fine for missing a day. If you go AWOL and stop weighing in entirely you will eventually get fined. PS to Liz: Eventually we’ll probably also have an option to show off your graph without showing your actual numbers. If you’re good at mental math you could report your numbers as an offset from your true weight. Maybe we should stick to true weights for this contest though. We’re going to make a group graph showing average weight lost and whatnot, which might break if people do that offset trick. All signed up, good luck everybody! SWEET! FOR CHARITY? I’m in! Thanks for answering Berry’s question, that was my first thought! This is a very cool contest. I’m all signed up. If things are going well and someone (not saying me!) reaches their goal well ahead of June 21, if they continue to lose weight, do they continue to earn points? Or, if their goal is achieved ahead of June 21st, can the goal weight be decreased so that points can continue to be earned? I am one of the lucky (?) souls that can’t GAIN weight. I’ve been the same within about 5 pounds since I was 25 years old except for illnesses or other short term events. (I guess I could make a flat yellow brick road goal and max out on all the points, but I won’t do that to everyone honestly trying to lose weight). I’ll still donate to WBR this year however. Have fun and good luck to all the participants! I totally get I won’t win a chance at the prize because I simply can’t check in every day. That’s ok with me but I want to be part of the group anyway. Between 2 and 3 days a week (and always in a row) I am out of town as an airline pilot. In fact, I leave on a trip midday tomorrow, Wednesday. Does it make sense for me to start my challenge tomorrow morning with a weigh-in, knowing I won’t be able to weigh myself again until Saturday morning two days later? Won’t I go over the line almost immediately, or is that the purpose of the flat start to the first few days of the line I see on some graphs? I suppose I could wait until Saturday and start then with a several weigh ins at home, but I really want to start tomorrow… I’m tired of putting off getting in shape again this spring and Lent starts etc. Fatty: Great cause, as always. And great prize. But daily weigh-ins are, in my view, the wrong standard for fines. Studies apparently show that daily weigh-ins help people stay mentally on track. But we all know that hydration, dehydration, and other random factors affect your weight at a given moment. Real weight loss progress can be made even with some daily fluctuations in the wrong direction. Much better to penalize based on a measurement every few days, or even once a week. So I plan to sit this one out. Although I am open to being persuaded that my view is wrong. Am I? Fatty only weighs 127? He must be super short to have a guy show like that. I keed I keed. I hope, for Fatty’s sake, that he didn’t just broadcast Hammer’s weight to the world. *gut. I meant gut. Autocorrect got me. Turn The Damn Cranks: you are “sorta” wrong. daily weigh ins are required to get daily points towards a chance to win Fatty’s prize at the end of this thing. they are NOT required to avoid fines. beeminder uses very highly customized formulas to create very reasonable ranges above and below your target line that change constantly but always give you significant margin for error. They treat a no-weigh in day as if you weighed the same as the day before so your weight will inch closer to the target line which is descending but it is very unlikely to put you over the line unless you were super over the line to start with or you don’t log your weight for a long time. I am likely going to sign up and I will be unable to log my weight daily so I doubt I’ll have a chance at a prize but the real prize is better health and I’m not concerned in general that my lack of a daily weigh in will cost me money. Beautiful pictures! Where was the top one taken? Glad you had a great time. 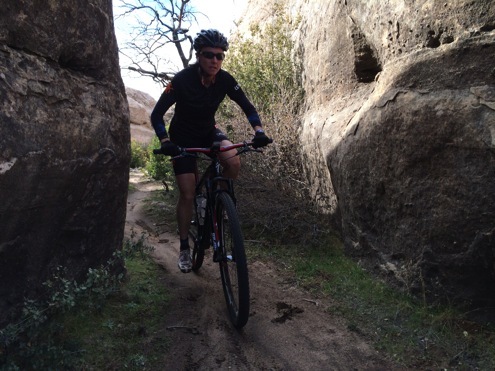 I’m going back to my twinky diet – great for downhill speed on the bike. @Bill: If you reach your target early then your Yellow Brick Road becomes flat but it’s all the same to Beeminder: just keep weighing in on that road, flat or not! The real point is to get to your idea weight *and then stay there*. So we definitely believe that the more data you collect the better, and that the Yellow Brick Road has enough width to accommodate fluctuations. And like David says, the penalties only apply when you go completely off track. You can easily avoid the penalties with intermittent weigh-ins, though you won’t get a lot points for the contest that way. Daniel… still have that quick question… can i start tomorrow knowing i won’t be able to log again for 2 days? it seems many of these charts actually show that first few days have a flat line before it starts down? @David C: Yes, absolutely. You’re right that the Yellow Brick Road is flat for the first week so definitely you can get away with a gap in the first week. I am way to much of a chicken (plump fat chicken) to sign up for this. 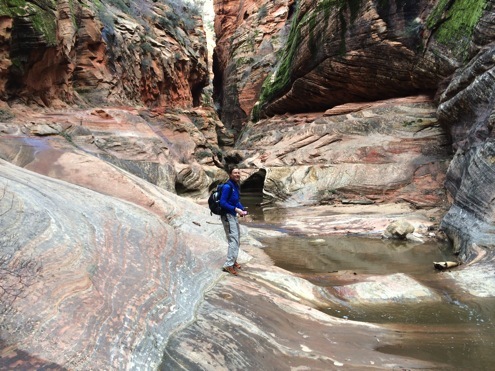 Oh… I love Zion Canyon! It smells so lovely in the spring. Would love to join your contest and would love to lose some weight but I’m at only 8% body fat due to severe OCCD. Not sure how to go about it. Would it even be healthy? Starting at (almost) the same weight as Fatty, although my goal is not quite as low because, um, because I’ll be building muscle along the way, ya, that’s it. Also, holy cow, so many people signing up! Thank you! The points aren’t showing up yet; we’re fixing that now. By “we” I mean Bethany who’s the one who writes the actual code around here. I was already using Beeminder, and I’m having trouble getting set up. Ideally I’d just like to start afresh as though I were first signing up as part of the contest. Instead, I’m forced into my old (failed) weight goal. Among other consequences, I’m not getting the first-fail-free starting point given to new users. Yes, I already had a free fail, but I just wanted to join the challenge with everyone else. I can’t exactly tell if I’m currently locked in to $5 or $10. In addition, my graph shows its fairly ancient start date. I clicked something about hiding previous data, but it doesn’t seem to have changed anything. Thanks, and sorry for all the questions. And whining. Lots of whining. @pfonke: Eep, it’s supposed to let you have a fresh start even with an existing weight graph. If you email support@beeminder.com we’ll fix you up! I was tempted until I saw the vig Beeminder was charging. They got paid up front, and shouldn’t take more than 2% of the penalty money. @blair: Beeminder doesn’t get paid anything up front. That $19.95 is all for World Bicycle Relief. LOVE this supporting the Hammer and WBR so I am all in. But howz about a back-up prize for those of us on the more, er, voluptuous side? Cuz I feel pretty damn sure that no matter how much I could possibly lose by June 21, even the largest Rapha would still not fit. Possibly ever :-) Even when I lose everything I want to lose, I’ll still be, er, voluptuous (read as being the lifetime owner of child bearing hips though long past child bearing). If not, no worries, still in, but let’s be clear, this site is called fatcyclist… some of us are living that dream baby! Oh and curse you for making the phrase “chorus of angels” pop into my head every time someone says or writes Rapha! I love this…I’m one of those akrasia people. I take back any sarcastic remarks I may or may not have made two posts prior. Signed up and all psyched about a new pair of shorts (and even more so about getting back to my college weight). Thank you FC! @FC excellent! As I said, I would participate in any case for the love of the cause but now I’ll happily forgive you for those accursed Rapha angels. And of course if I manage to defy the laws of physics and lose the remainder of the 160 pounds by Sept 1, BostonCarlos told me he’s going to come out here again so we can ride our Ripley’s together. Course mine would be waaaay prettier than his…. jes sayin’ Carlos! Okay not sure why that posted as anonymous above but guessing you figured it out anyway. Hi ho I go back to work. Forgive my ignorance, but I signed up yesterday and have no idea how to enter today’s weight. I’m entering it in boxes on my page but it’s not sticking. I did lose weight! Thanks. Never mind . . . I figured out I have to enter the day (in this case, “6″), a space, and then my new weight. Now it works. I’m in. If I hit my goal, I’ll be a half-inch taller and 28 pounds heavier than vincenzo nibali. how is he 139 pounds?! David C.: use the baggage scales? That should make for some interesting conversation with the front staff! I’d like to but I know I’m too lack-a-daisal to stick to it. And it’s only 10lbs! I’ll think about how badly I want to not look like a stuffed sausage in my spandex. Anybody have a good recommendation for a reliable home scale. I don’t need the hydration, fat%, etc. features just weight. I have tried 2 different ones and they are not reliable. I can get on and off them 2-3 times right after one another and the weight values will be over a 5lb range. Lulea: I bought this scale a while back for my weight loss and it’s within 2-3 tenths of the high dollar scale in the doctors office. I started a new diet last sunday and have lost 9 pounds. Can I count from that number? It looks like the Hammer will hit her goal before the competition even starts – she’s such an over-achiever! @Liz M: Yup, we really appreciate getting questions like that, even if you end up figuring it out, since it tells us what things are currently too confusing. @Lulea: Bethany and I have a Withings scale which is pretty amazing. We got it 5 years ago and it’s rock solid. Withings and the Fitbit Aria scale are the two that Beeminder integrates with. It’s super slick — you just step on the scale and your Beeminder graph magically updates. There’s literally nothing else you have to ever do once it’s set up. Except for, you know, losing weight. @SLL: No, but remember this isn’t a contest about how much weight you can lose, but about slow and steady progress toward where you wan to get to. I signed up yesterday. Good luck everyone! Oh shoot, I just read the fine print and saw I would get less points for “outperforming” the graph. That’s gonna hurt me the first couple of weeks (assuming I stick to plan) since initially I will lose big chunks of water weight I have regained. BTW Fatty – I used #awesomesauce in a corporate communication today that was sent to more than 6k employees… oh yes I did. Great work Fatty, I love the way your comps are always just a little bit different from anything anyone else is doing. Just wondering what happens AFTER 21st June. This is such a great idea, but to be honest I can’t see me keeping up the daily weigh-in beyond the end of the comp (whether or not I’ve hit the target), so I can imagine I could rack up quite a credit card bill. Assuming that the end of the comp is the end of the (financial) commitment, then I’m in. Daniel Reeves – once on beefinder and my account how do I look at the competition leaderboard without coming back to this block to click the link? oops meant blog not block. Looks like you got a lot of fat followers. Godspeed! @Steve: After June 21… We hope you’ll keep on reporting to Beeminder indefinitely to keep your weight from bouncing/creeping back up after the contest! @Lulea: Check out the Fat Cyclist widget thing we just added to the right of your graph. I guess we haven’t yet but we’ll include a link to the leaderboard there too. So, I signed up Thursday evening, March 6th. After using a stealth weight-loss grace period for Jan/Feb, I walked to the scale and recorded 182.4 as a starting weight with an ending goal of 159.9. Very next morning my weight was at 180.0 after doing nothing but sleeping and taking a leak a couple times. Good day yesterday and I was at 179.2 this morning… so I am well below my yellow brick road before we even started. Although the points competition is not my primary motivation, I’d still like to start off on the road and try to stay there with some blue dots. So what should I do… lower my end goal significantly? Change my starting weight? Chug down a 12-pack tonight? 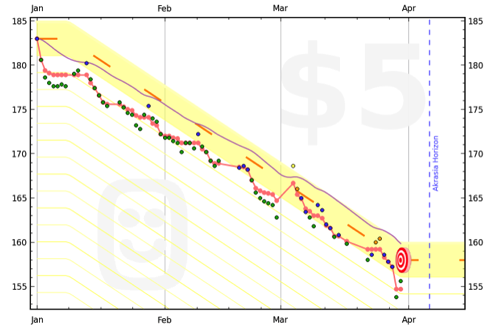 ctrshirey… if you go to beeminder just below the graph you will see “Retroratchet” it will immediately cause the yellow road to drop from your current weight towards your goal with no week of flatness NOR any advantage for the weight you have lost already. it makes it harder, right away instead of giving you a week to use a cushion… have fun! OK, I cannot sign up with the escalating fines (For several reasons). However, I do not want Beeminder to make nothing off me given Fatty’s explanation of their investment of time in this project. Is there a way to just pay the initial sign up fee, and then also pay a small fee to Beeminder to thank them for their efforts? 1. YOU CAN SET BEEMINDER TO **NOT** ESCALATE YOUR FINES! While having them escalate is motivating you can have them stay a flat $5 time after time. 3. You can CHANGE YOUR GOAL or QUIT ENTIRELY with a weeks notice or anytime you go over and get fined. To sum it up, the escalating fines are motivating but at anytime you get fined or you realize you just aren’t going to make it you can stop OR better yet, just change your goal to be more realistic. If you don’t want escalating fines you can turn them off too! How long does it take Beeminder to sync with Withings scale data? I weighed in about an hour ago and the data is in my Withings account and on my connected iOS devices. Thanks! @David C: Thanks so much for helping answer questions! You’re obviously a veteran Beeminder user. Hugely appreciated! Everything you say is exactly right, with one subtle exception. You’re right about the road reseting with a flat spot, etc, so it’s not like you’ll be charged again and again every day if you’re off track. But we no longer wait for you to confirm that you want to keep going after you derail. You can quit anytime, like you say, but you have to explicitly cry uncle (easiest way is to hit the Archive button on the goal). Gory historical details at http://blog.beeminder.com/nwo . PS: Fatty actually shows exactly where to click to turn off escalating fines in the post. @Kamala, it’s normally instant but sometimes the Withings-Beeminder connection flakes out and it could be delayed (though should still show up eventually). Can you email us at support@beeminder.com so we can check it out? It’s all good as far as I’m concerned. Otherwise, I know I could manually count on the Beeminder site, but I am guessing FC or the Beeminder peeps already know… so how many people are signed up and thus how much raised so far for our new WBR ambassador? GO HAMMER! Hey everyone, all the latest questions are answered in Fatty’s new post — http://www.fatcyclist.com/2014/03/11/last-day-to-register-for-weight-loss-challenge-plus-helpful-tips — so let’s move further discussion there. Thanks again for the amazing response to this! Game is on! Well, it is a very successful sandbox style video game that allows you to create and design anything you want. But, before you buy, consult your veterinarian or local pet supply store. questions on May 3 concerning how exactly to become a ‘Battlefield 4′ premium member. at net, but I know I am getting know-how every day by reading such fastidious articles. Impresionante cuestiones aquí. Soy alegro ver Poste . Gracias mucho y Estoy echar un vistazo a touch usted. ¿Va a amablemente mándenme una electrónico ? than acquire the FIFA World Cup 2010 if they want to remember to their followers, back again home. They will want to play Samba style and not muscle mass their way to the crown. their mentor was summarily fired for leading his group to the quarterfinals. be deemed one of the greatest 8 teams in the world when it comes to soccer. But in Brazil, it’s a World Cup title or absolutely nothing. anchovy, sardines, trout, herring and menhaden. look over it all at the minute but I have book-marked it and also added your RSS feeds, so when I have time I will be back to read more, Please do keep up the superb job. wasn’t. You need to have a number of superfoods in your diet daily. carries remarkable and actually fine information in favor of visitors. Hi there, this weekend is nice designed for me, as this point in time i am reading this great educational piece of writing here at my residence. artikel ! Det är små förändringar som kommer att göra det viktigaste förändringar . Tack för att dela ! This is a great way to get involved with music, without the need for an instrument. that a huge majority of music students have higher intelligence than others. Guitarists who perform on stage while standing need to have a strap to support their instruments. Great blog you have here but I was wanting to know if you knew of any forums that cover the same topics discussed in this article? We at Examiner came across a slew of download codes we haven’t had a chance to give away. coding know-how so I wantred to get advice from someone with experience. also contains CoffeeBerry® to give you a healthy boost of antioxidants.